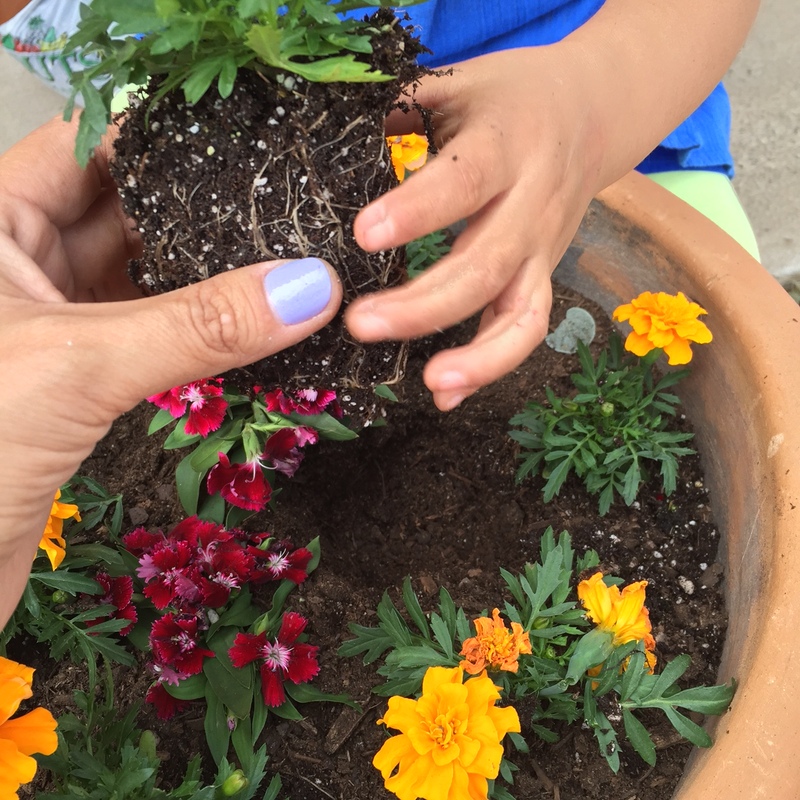 Yesterday, my niece and I spent the afternoon planting a batch of flowers in my yard. It was our first gardening endeavor together and it was filled with profound ponderings only a three-year-old can conjure. As we planted the blooms I told her about how I planted flowers with my late Nalí asdzaan. She asked if my Nalí asdzaan was as silly as her Nalí (my mom). I told her she definitely was. We laughed in the cool spring breeze certain of the exact kind of silliness we meant and continued to arranged the flowers in the planters. It is fitting we chose yesterday to plant as today marks three years since her passing. I wrote on one of my social media accounts how my longing for her has changed. I still miss her deeply but somehow, I am able to understand she is with me, perhaps even closer than before and for the moment that seems satisfying. I know this feeling will flow and shift back to the unbearable feeling of loss from time to time but today, for now, I feel grounded in my grief and grateful I am able to appreciate knowing such a beautiful being. As we planted the last few flowers, I started talking to the flowers – telling them thanks for coming home with us and how beautiful and strong they are. Angela asked me why I was speaking to them. I told her this way they know we want them to be here, this way they know we appreciate them. She smiled and then started to talk to the flowers too, giving them thanks. It reminded me of the songs I’d heard my Poogie sing as we planted in the corn field. I don’t remember the words today but I remember her spirit so grateful and hopeful for what was to come forth from the field. Planting with Angela, I looked ahead to her starting school and one day her Kinaaldás. I wondered about my life and if I will ever get to be a mom or what new career adventures I will have. Then I turned to how much life I will experience without my Nalí asdzaan and it is startling. But as I touched and turned the soil in the planters I realized when my Poogie was here she planted so much in me. Different seeds I am not even aware of – that I don’t even know. I believe she wouldn’t have left us if she didn’t think we could thrive. So I am going to bed tonight, with a grateful heart for all the adventures I have had with both my beautiful niece and my late Nalí asdzaan. Two lively, fierce and strong Diné women whose presence in my life feeds my work and nurtures my spirit. Tonight I pray for the words of those planting songs to come to me in hopes they continue to nourish the seeds of resilience planted in me. I also pray tonight for the unknown seeds in me – may they continue to grow within, rooting me in a culture so beautiful and complex it will always deliver me what I need as long as my heart is open and willing to cultivate it’s essence. One of the many things I love about my relationships with my Native sisters and brothers is the earthiness of your grounding. Thank you for reminding me of the beauty and peace that are generated from a grateful heart when we take the time to refocus on Mother Earth and the regenerative hope that lies in it. Thank you Karen, your words and support mean so much! Beautifully written. Sometimes what we lose is actually something we gain and it can bloom over time. Thank you Mikaela, you’re right!! Dear Jaclyn, thank you for sharing your memories of your late Nalí asdzaan; they’re very encouraging. Especially for me as I’m mourning the loss of my grandmother and godmother who passed away this June. I find hope in your words when you say, “I believe she wouldn’t have left us if she didn’t think we could thrive.” It is beautiful to read how you are planting the seeds in your niece that your Nalí asdzaan planted in you. Thank you again for sharing! Your note Las Potosina, found me at the perfect time. Ahe’hee’ for sharing your thoughts with me as the words mean a lot. My heart, thoughts and prayers are with you as you continue to heal and find a “new normal”.